M. Night Shyamalan wraps his unexpected superhero trilogy with Bruce Willis, James McAvoy and Samuel L. Jackson. WASHINGTON — M. Night Shyamalan raised eyebrows when his thriller “Split” (2017) turned out to be a surprise sequel to “Unbreakable” (2000). The latter was not only a worthy follow-up to his masterpiece “The Sixth Sense” (1999), it was ahead of Hollywood’s comic-book curve with a textbook example of superhero storytelling done right, rivaling “Batman Begins” (2005), “Wonder Woman” (2017) and “Black Panther” (2018) as the finest origin stories ever made. Now, the unexpected trilogy wraps with “Glass,” a film that will likely please fans of “Split” but sorely lacks the slow-burn originality of “Unbreakable.” If you go in fresh, you’re bound to be confused, but if you rewatch the first two chapters, you’ll find a few nostalgic shards of glass. It all depends how you view the state of Shyamalan’s career — glass half full or half empty? The story involves vigilante security guard David Dunn (Bruce Willis), who uses superhuman strength and sensory intuition to track kidnapper Kevin Wendell Crumb (James McAvoy), a disturbed schizophrenic with 24 different personalities. Their collision course lands them in a mental institution run by Dr. Ellie Staple (Sarah Paulson), who skeptically studies her patients, including Dunn’s nemesis, the wheelchair-bound criminal mastermind Elijah Price (Samuel L. Jackson), who devised the train wreck that Dunn miraculously survived in the first installment. If anything, “Glass” is another reminder of the endless possibilities of McAvoy as an actor, from his BAFTA nomination for “The Last King of Scotland” (2006) to his Golden Globe nomination for “Atonement” (2007). For me, his most underrated work was across Jessica Chastain in the indie romance trilogy “The Disappearance of Eleanor Rigby” (2013-2014). It’s truly stunning that an actor of such obvious range has never been nominated for an Oscar. Thus, fans of “Split” will love that “Glass” is once again the McAvoy show, giving him numerous show-stealing scenes as he shifts between identities, from a nurturing woman to an innocent child to a mutant alter-ego known as The Beast. The demanding role combines the superhero powers of his Xavier role in the “X-Men” prequels (2011-2016) with the facial ticks of Anthony Perkins in “Psycho” (1960) and the “et cetera” quips of Yul Brynner in “The King and I” (1956). In fact, McAvoy steals so much screen time that it leaves Willis little to do, a disappointment considering this was supposed to be his triumphant return after “Unbreakable.” This reveals structural issues within the overstuffed script, which falsely sets up Willis as the protagonist working with his tech-savvy son Joseph (Spencer Treat Clark). All grown up, Clark is still instantly recognizable from his child roles in “Gladiator” (2000) and “Mystic River” (2003). 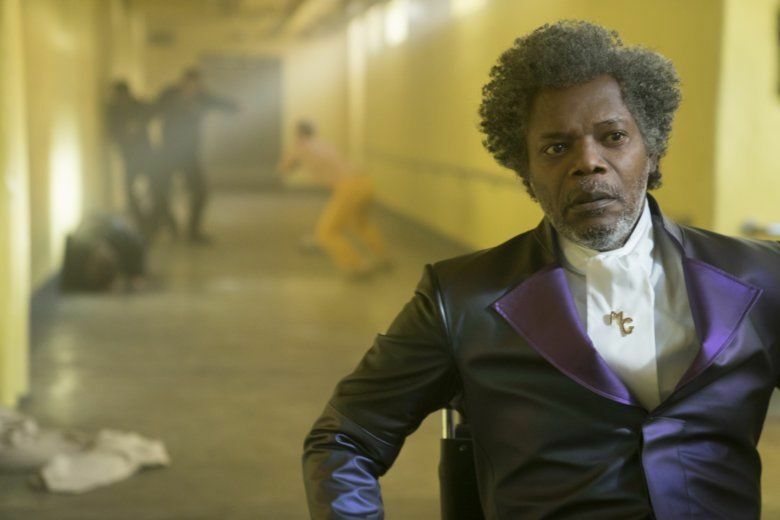 You might see other critics argue that Samuel L. Jackson also gets insufficient screen time as Mr. Glass, especially since the movie is named after him, but those charges are overblown. Jackson’s anticipated appearance, while admittedly delayed in its rollout, ultimately gives him ample time to shine in the way that only Jackson can, allowing the narrative to finally take off. It’s during this stretch that Paulson interrogates Jackson, Willis and McAvoy, seeking logical explanations for their super powers in an attempt to convince them that they are mere mortals wishing they were special. Here, Shyamalan hits his thematic stride, making clever commentary on society’s larger cultural obsession with comic books. It’s a fascinating dive into the realm of reality vs. mythology and a banner defense of superhero fans everywhere. Unfortunately, the satire often veers into on-the-nose dialogue. At times, it’s cheeky fun, as Jackson tells a soon-to-be victim, “This is where you’d have a confused thought bubble over your head.” Other times, it’s downright ridiculous, as Jackson trumpets plot points: “Here it is! The reunion of main characters known as the showdown!” It’s a contrived moment bringing together the trio’s closest confidants — Clark as Willis’ son, Charlayne Woodard as Jackson’s mother and Anya-Taylor Joy as McAvoy’s ex-victim in a bizarre case of Stockholm syndrome. While this three-way climax outside of the mental facility is over-the-top (i.e. “Deadpool 2”), Shyamalan deserves credit for avoiding an alternate finale atop Philadelphia’s fictional new skyscraper resembling the One World Trade Center. As he teases this potential battle, viewers will dread a glass-shattering finale like “Rampage” (2018). Thankfully, it’s a red herring to hide a different twist — or shall we say several twists — which we’ve now come to expect from Shyamalan every bit as much as his Hitchcock-style cameos, which he once again does here. Even if “Glass” doesn’t crack his top handful of films, I’m still rooting for M. Night Shyamalan. I’ll forever root for anyone who can write and direct a film as masterful as “The Sixth Sense” (1999), which remains my favorite movie theater experience and an instant classic voted one of the American Film Institute’s Top 100 Films. I’m even a fan of his polarizing “Signs” (2002) and “The Village” (2004), which paved the way for “A Quiet Place” (2018) and “Bird Box” (2018).